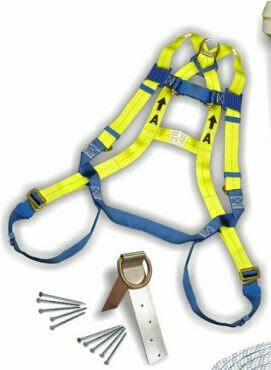 The harnesses are yellow and blue, have an "up" arrow on them, and do NOT say CSA-Approved. Or if they do, in some instances, CSA-approval is missing from key components. Non- CSA-approved fall safety systems are being sold in buckets at big box stores. 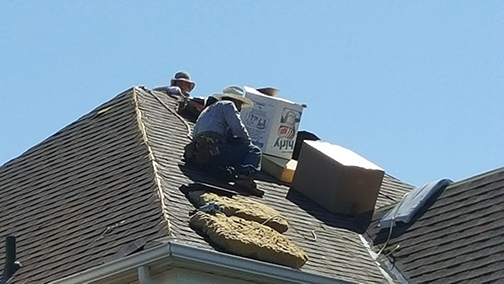 They are often billed as “Roofer’s Kits.” Why is this inferior gear allowed to be sold? It’s a question I hear all the time, especially from participants at our Ontario Ministry of Labour-approved Working at Heights courses. The harness shown in our photo is one of the main offenders over the past years. I’ve seen many construction workers wearing this gear. The problem is, this particular set-up might not hold a falling worker, causing them injury or death. If you know anyone who wears one of these bright yellow and blue harnesses, with the letter A stamped on it, including an arrow up symbol (see photo) I urge you to bring it to their attention and hopefully they will get themselves into a CSA-approved harness, preferably one made in Canada. The Occupational Health & Safety Act in Ontario – and I’m sure in most provinces – requires only CSA-approved fall systems to be used on construction workplaces, including home renovations. I recently did a very thorough inspection of two of these buckets, stuffed with Chinese-made products, assembled in Montreal and distributed Canada-wide. On the outside of bucket, it says ‘Meets CSA Standard.’ THAT IS NOT THE SAME AS “CSA-APPROVED”!!!. These plays on wording, for a product intended to save a person’s life, are just not acceptable!!! A second bucket had many items inside stamped as ‘CSA Approved,’ but there was no such approval on the temporary anchor point. What a great idea – make the weak point in the system the non-compliant component! The anchor point I inspected was lightweight, seemingly of low quality and, in my experience, would not arrest the force of a falling worker. Is it worth the gamble to buy non-CSA-approved fall arrest harnesses? Think about what your own life is worth – and what it is worth to your family. And then make the dollars and cents decision that seems right for you. And I am wondering why the big boxes are even offering you this particular “savings” on products that are supposed to be saving your life. Will getting three quotes find the bad banana? In a work site accident, is calling 911 your rescue plan? Previous post Who really needs Working at Heights training in Ontario?